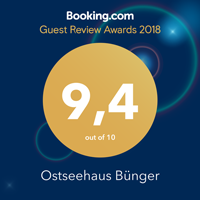 The ambience of a peaceful seaside resort yet still located centrally: Ostseehaus Bünger in the seaside town of Strande on the Kieler outer fjord is just 15 minutes by car from Kiel city centre. From Kiel, the regional capital, follow the national roads B76 and B5033. If you’re coming by train, go to Kiel central station and take buses 501, 502, 901 or 33 to Strande. During the summer months, you can also take the Fördedampfer (fjord steamboat) from Kiel city centre/station all the way to Strande.